As I start to type the first words, we are 5 minutes from the broadcast start of game 1 for the Stanley Cup. And with commercials, Doc and Edzo and the dipwads back at the hockey network, probably closer to 20 before the puck drop. Now, I talked a bit about a trade with a Lightning fan on Monday, and yesterday used Upper Deck to predict the Cup winner. But what about the other 28 teams that tried so hard to make it to this point (except the Coyotes)? They have been on the golf course for a month in some cases. The fans for those teams, and I know you are out there, deserve a little something to make them smile about the 14-15 season. They didn't make the finals, honey. I alluded to an announcement today, so here it is: FREE HOCKEY CARDS! Yup. If you are a fan of one of the 28 teams that didn't make the finals, just leave a comment and I will send you a super PWE of cards. A super PWE is a nine card page cat into thirds and stuffed with cards. About 25-27 cards per envelope. I have at least 50 cards per team, so if you see someone post a team, you can pick it too. And when all is said and done, you may get a 2nd or a 3rd mailing since I plan to empty out this 5000 count box this summer. 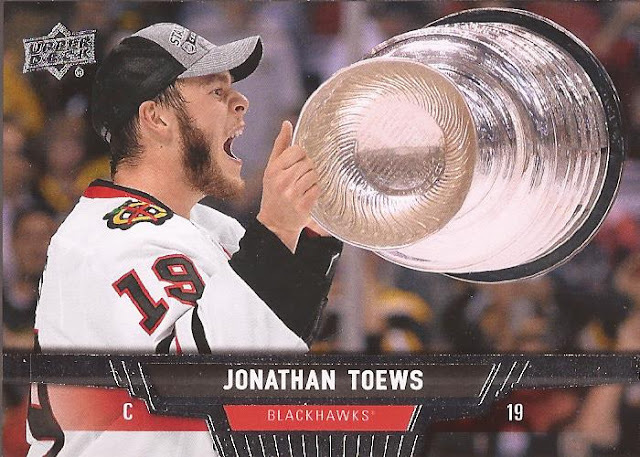 Oh, and if you want cards from the 5 time Stanley Cup champion Chicago Blackhawks, I got some of those. Just no Lightning - Jeff has them all. Details: Yes, there is junk wax era in there, but the cards do go up to current releases. They are from sets I don't plan to collect, dupes of other sets, cards from repack boxes - you name it. And did I mention hits? Yup - there are relic and autograph cards to be had too. I won't tell you which teams, but these are cards that won't go for high money on ebay. I don't want the hassle of scanning and posting for it to sell for a buck. Better to give it to someone who will love it for simply leaving a comment. And that is all it will take. Leave a comment below with the team you would like. If you are certain I have your mailing address, then we are good. If you are not sure, or you think I may not be able to associate your nickname with your real name, shoot me an email to my gmail account - 2x3heroesATgmailDOTcom. Subject it so I can find it easily and I'll get mailings out this weekend. You don't need to follow my blog. Pimping is not required. If you want to do either, thank you. But please help me put all these cards into your hands, cuz they belong somewhere nicer then the bottom of the box pile. Wow you're very generous. Red Wings please! I'll take the Bruins! Perfect excuse for me to send you some cards too. I no sooner posted the reply than I got your email. ha! Haven't got any Capitals for a while. I'll email my address. You rock! NJ Devils, please and thank you. Dang it someone already took the only team I care about the Caps. Oh well. Are there any Whalers cards anymore? Thanks for the chance....looks like I am late for the Devils but thanks anyway! I'd like to try for some Wild! My wife is from Minnesota, don'tcha know!! Oh you know me so well as I got the Flyers! They won the Cup back to back when I was 9 and 10 and I've been waiting 40 years for the 3rd! There is always next season right. BTW is Kate Upton sleeping with someone on the Rangers now? Thought it was the Tigers?!?!?!? Got my Capitals over the weekend ~ Thanks!